Trauma-informed care (TIC) is still a relatively new concept and not fully understood or implemented in many healthcare settings. Nurses are the healthcare professionals most likely to have the first contact with many patients, and nursing training and process emphasizes a person-centered relationship, enabling nurses to be advocates for a patient’s advancement toward recovery and optimal health. While a robust trauma-informed nursing care literature exists for mental health and pediatric settings, less has been written to guide nursing care in adult medical settings including primary care, emergency department/urgent care, and inpatient medical-surgical settings. To spread TIC, health systems and nursing leadership should identify knowledge deficits and provide education for the entire nursing team that describes the interplay of neurological, biological, psychological, and social effects of trauma to reduce the likelihood of re-traumatization and aid in the understanding of how a patient’s presentation may reflect an exacerbation of past events. Nurses are the ideal clinicians to engage a patient in understanding their own illness and health. Application of a nursing TIC approach may improve outcomes and potentially decrease care utilization and costs. Nursing is a critical component of any trauma-informed delivery system, and this chapter will provide nurses with a framework to apply TIC in the adult medical setting. American Association of Colleges of Nursing. Violence as a public health problem [position statement]. Washington, DC; 1999. Accessed 2 June 2018. Available at http://www.aacnnursing.org/News-Information/Position-Statements-White-Papers/Violence-Problem. Schulman M, Menschner C. Laying the Groundwork for Trauma-Informed Care (Brief). Hamilton, NJ: Center for Health Care Strategies; 2018. Accessed 2 June 2018. Available from: https://www.chcs.org/media/Laying-the-Groundwork-for-TIC_012418.pdf. American Nurses Association (ANA). The nursing process. Accessed 15 December 2018. 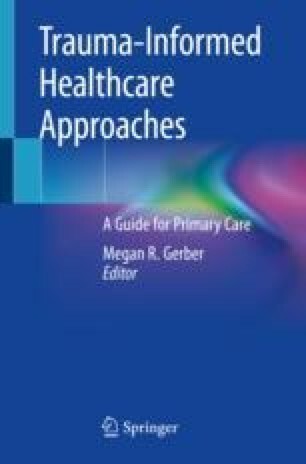 Available from: https://www.nursingworld.org/practicepolicy/workforce/what-is-nursing/the-nursing-process/. Basile K, Hertz M, Back S. Intimate partner violence and sexual violence victimization assessment instruments for use in healthcare settings: Version 1. Atlanta: Centers for Disease Control and Prevention, National Center for Injury Prevention and Control; 2007. Accessed 3 June 2018. Available from: https://www.cdc.gov/violenceprevention/pdf/ipv/ipvandsvscreening.pdf. Sinsky C. Pre-visit planning: American Medical Association; 2014, October. Accessed 15 Dec 2018. Available from: https://edhub.amaassn.org/steps-forward/module/2702514.